Last weekend witnessed the opening of an extension to the green line of LUAS, Dublin’s tram network. 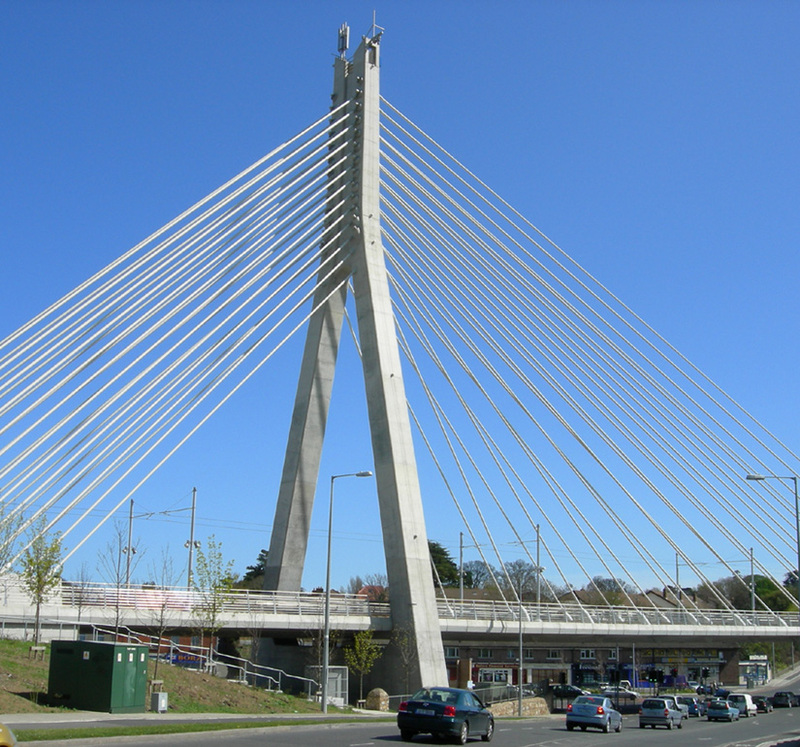 It therefore seems timely to discuss the biggest bridge on that particular tram route, the William J. Dargan LUAS bridge. 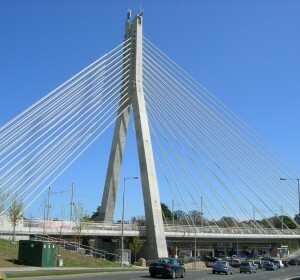 This bridge carries the tram line over the busy traffic junction known as Taney’s Cross, which is close to the centre of Dundrum, a south Dublin suburb. 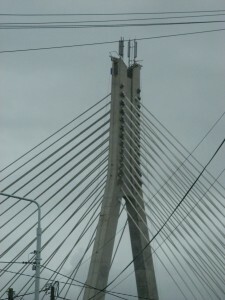 The bridge itself is a cable stayed concrete framed bridge with a semi-fan cable arrangement and inverted Y pylon. 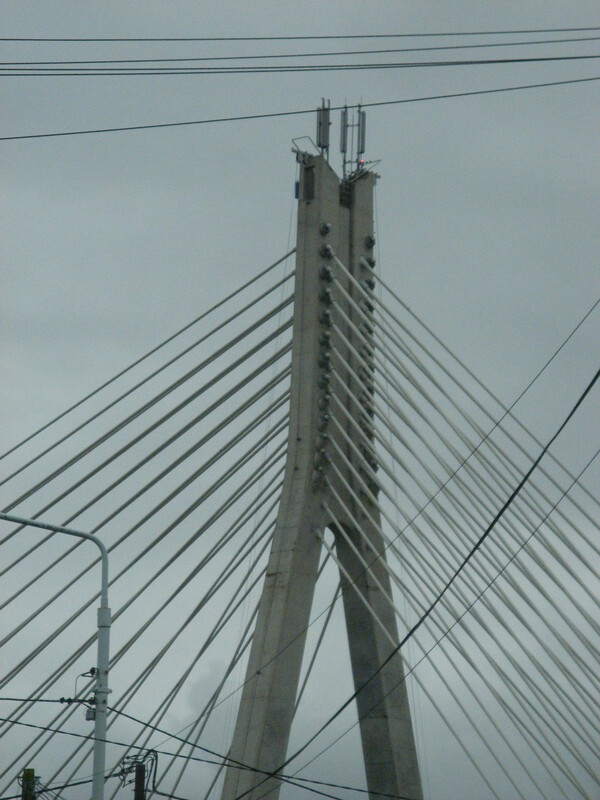 The pylon height is 50m, the main bridge span is 108m and the cost was approximately €11 million. Designed by Roughan and O’Donovan Consulting Engineers and completed in 2002, it has become a significant landmark for the largely low rise surrounding area. 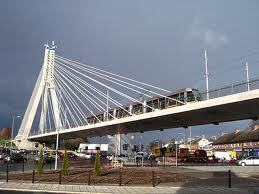 The bridge is named after William Dargan (1799-1867) who is widely regarded as the father of Irish railways. Born in Killeshin, Co. Laois in 1799, he was the engineer on the country’s first railway, Dublin to Dún Laoghaire, (which is considered to be the world’s first commuter rail line), and on the old Harcourt Street rail line which now forms much of the route of the Luas Green Line. The bridge itself is a stunning example of modern structural engineering, but visually it is spoilt by the numerous mobile phone masts which have been erected on top of the main pylon. It would seem ludicrous to spend €11 million to create a land mark structure and then disfigure it by positioning a confusion of ugly phone masts on its highest point. I would suggest the phone masts should be removed or at the very least hidden behind a signal friendly screen which matches the colour of the concrete below. Phone masts on top of the bridge, seems like a desperate attempt to earn some cash. You know mobile phone companies pay top dollars to site their masts. Particularly now the town is saturated with masts everywhere, there is little room for 4G upgrades while trying to keep the 2G and 3G going simmultaneously.